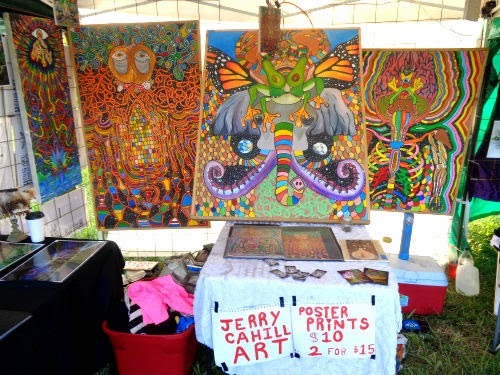 Jerry Cahill's art on display at Blackstock Music Festival. I had the chance to sit down with St. Petersburg artist Jerry Cahill while I was volunteering in the art gallery at Blackstock Music Festival. When we spoke, he had just quit his job, moved out of his house, and was planning to take his work on the road as a full-time artist. He said that it was a good time in his life, that he had just gotten his A.A. degree, and that he had saved up some money in preparation. "... I gotta figure out what I want to do with the rest of my life, so I'm kind of taking a break on everything." "I used to go to festivals and see all the live painters, and I was like, 'How do they get in on this? How does this work?' and just observe the controlled chaos of it all. And then I found out, just anyone can come and paint, so you just bring your paint and set up an easel. Just like anyone's allowed to come dance, anyone's allowed to come paint. Do that; make some connections. Most of the websites for the festivals have links for where you can find the arts directors, and just email those people a bunch. Be persistent." Jerry paints in an intensely vibrant style, arresting the viewer's eye with an explosion of colors and shapes. He says it has always been that way, and that a printmaking class he once took helped inspire his method. "Ever since then my style of painting has been very akin to the process of printmaking. Nothing overlaps. It's all design-based, so that way I can get juxtaposition of different colors. Just 'cause they don't overlap, so they're more bright." Working on large canvases can get pricey quick, so Jerry stretches his own to cut down on costs. He mainly uses acrylic paints, which are most suited to his process of working one color at a time, allowing each to dry before moving on. His larger, more intricate paintings take about a month to complete, though he once finished a 4-foot live piece in one day. Now that he can devote more time to his art, Jerry hopes to start producing more rapidly. Jerry says he is deeply inspired by music, but that really anything can set off the spark. He's constantly taking in everything around him and creating a mental picture, even in situations that might seem extremely mundane. "Math class inspires me to draw. [Because I'm] trying to block out math class." He was encouraged to pursue his craft by teachers at his arts magnet high school. Now he is painting live at events all over Florida and elsewhere in the U.S. Jerry also paints with other artists in the blossoming St. Petersburg art scene. Are you a live painter? Or do you prefer a solitary process? Do you have any tips for artists who can't decide if live painting is right for them? Leave them in the box below and subscribe to get more articles like this in your inbox.